Hospital information systems, hospital and physician patient registration systems, image and signal processing, patient facing systems, information systems, transaction processing systems, electronic medical record systems, algorithmic / statistical methods, protocol development, mobile and wireless health, artificial intelligence, document handling systems, systems integration, organizational, economic, social, clinical impact, cost-benefit aspects of IT applications in health care. 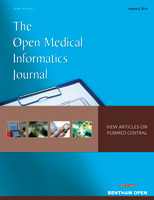 The Open Medical Informatics Journal, a peer-reviewed journal, is an important and reliable source of current information on recent developments in the field. The emphasis will be on publishing quality papers rapidly and making them freely available to researchers worldwide.